Common in cats, ear infections stem from several causes. Catching and treating your cat's ear infection early and keeping her ears clean, says the Long Beach Animal Hospital, are critical to keep her from developing a chronic problem. Cats with ear infections shake their heads or paw at the affected ears and rub them on the floor. 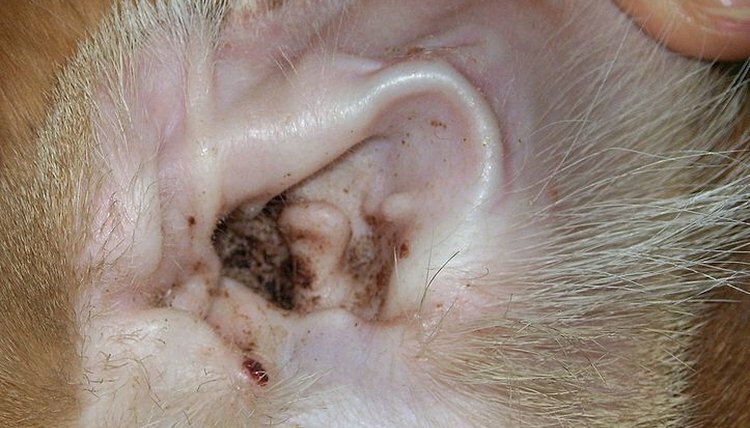 A black powdery discharge signifies ear mite infection, while pus comes from yeast or bacterial infections. Ticks, ear mites, allergic skin reactions, and foreign material lodged in the ear canal can all produce feline ear infections. So can hair matted within the ear canal, which traps moisture and wax in which bacteria multiply. Untreated ear infection may cause facial nerve paralysis. The constant head-shaking and pawing could create an aural hematoma (buildup of blood outside the blood vessels) in your cat's ear flap, requiring surgery. Yeast infections require antifungal drugs and bacterial ones, antibiotics. Cornell University advises treating ear mites with weekly ivermectin doses or veterinarian-administered shots for two to three weeks. Monthly topical flea treatment with selamectin or moxidectin applied to the skin at the base of your cat's neck behind her head will prevent ear mite infection. Regular ear cleansing with a solution formulated for cats also discourages infection.